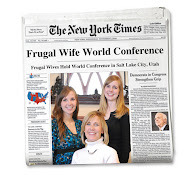 I'm so honored to guest post on my very favorite frugal blog! Thanks, Merrick! By way of introduction, I'm Britt of The Skinny Bovine's Kitchen, also previously next door neighbors to the Frugal Wives' whose blog we all love so much. I blog about eating healthy on a very tiny budget - hope you stop by! In addition to being food-frugal though, I'm pretty frugal with other things as well since after almost five years of marriage/school and 2 kids my husband is starting his first real job this month! I'm so thankful for what I've learned the past five years and it forever continues to shape my spending, so I'm always looking for other ways to save a buck. Two of my aunts love and swear by homemade wipes (10 kids between them) and I learned and adapted this recipe from them. I love them because they are much cheaper and much less wasteful than normal wipes. Do you hate using an entire store bought wipe just to make sure baby's bum is clean after a pee-only diaper? No more! Just tear off a piece just big enough to do the job and viola! Clean bum, happy mom, money in your wallet. Here are your rough directions. Adapt according to your liking! Hope you love them as much as I do! Happy wiping! What a cool idea - I've never thought of this! Great idea! Can you please post a picture of the finished product in the Rubbermaid? I can't picture it! When you say, stuff it in your tub, you mean the tupperware tub, or the bathtub? I could do with seeing a couple pictures, too.